The Mask Increment string: The mask increment string (which is set up by using the MaskIncrement property of any TextItem or BarcodeItem object) is the value to be added to the text on each label to be printed and should match the Mask string length. The default value for the increment is equivalent to a decimal value of 1 (one). The string is composed of any characters defined in the input mask string. Invalid characters are assumed to be equal to a value of 0 (zero) in that characters position. The increment value for alphabetic strings start with 'A' or 'a' as the zero placeholder. This means to increment an alphabetic character by one, a value of 'B' or 'b' must be in the increment string. For characters that do not get incremented, the '%' character needs to be added to the increment string. In the following sample, each label features a TextItem which will serialize a product model ranging from "MDL-001/X" to "MDL-010/X" (i.e. 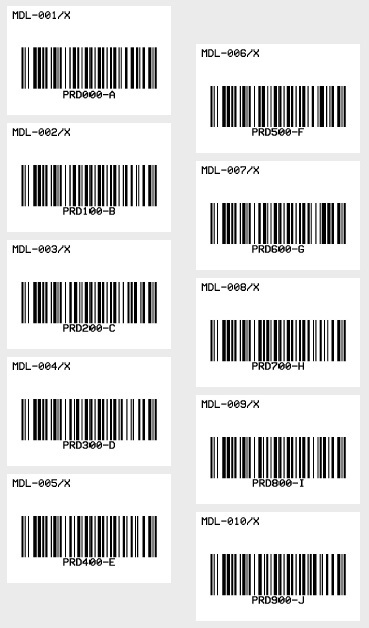 the sequence will be MDL-001/X, MDL-002/X, MDL-003/X, ..., MDL-010/X) and a BarcodeItem which will serialize a product ID ranging from "PRD000-A" to "PRD900-J" (i.e. the sequence will be "PRD000-A", "PRD100-B", "PRD200-C", ..., "PRD900-J") in Code 128 symbology.